Have you ever gotten back from a trip, or jumped back into work after a busy weekend, and your mind felt like a mess? I’ve literally replicated this method hundreds of times, and it always works. 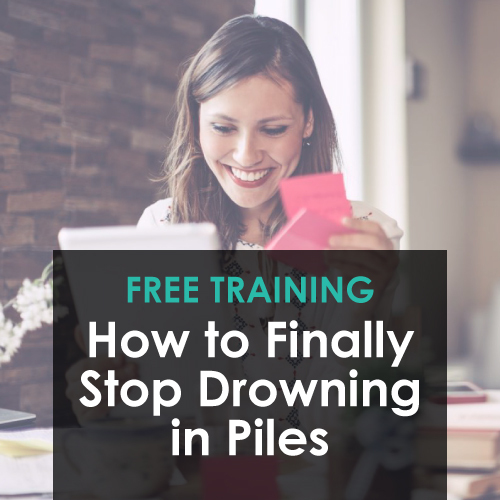 I first learned about these from David Allen’s best-seller, Getting Things Done®. Essentially, they’re commitments made to yourself or to another person that haven’t yet been fulfilled. They’re hanging out in limbo (your brain), and they essentially drain your energy without you even realizing it (like when you have a bunch of apps open on your phone at the same time). I have 65 emails needing my attention. Most of them are quick, but some of them represent bigger challenges I need to resolve. My good friend is moving this week, and I told her I would help her, but we never decided when. I finished a Q&A class the other day with a group Eric and I mentor, and I need to post the recording and a bunch of links that go with it. Our car is atrocious after driving 10+ hours with our four children, and there are a few things in the trunk that need to be carefully stored in the garage, but I need to find a place for them first. Eric and I are diving deep into YNAB and working really well together on our budget, but I haven’t put in any of the quarterly or semi-annual billings, and I need his help. I also forgot to log the receipts for purchases I made yesterday (because my phone battery was low, and I didn’t want to use it while I was out and about). I told the piano teacher I would send him his payment this month via PayPal because I was out of checks, but my new PayPal account required me to wait two days before I could link my bank account, and I think it should be ready now. I’m podcasting with Jonathan Bailor for the SANE Show this Friday, and we were originally going to have Alia on the show, but she’s going to be at a conference, so I need to figure out new topics. I spent the whole vacation brainstorming AMAZING goals and ideas into a spiral notebook, and I am dying to get them into Asana, which I’m currently using for task management, but I need quiet time, and there simply hasn’t been enough. I have a podcast with Greg McKeown (author of Essentialism) ready to go, but 16 different things need to happen for each podcast, and I want to type out the steps and create a replicable process for future podcasts, so this is kind of waiting until I have time. Eric and I are re-doing our shopping cart, and we need to figure out our pricing structure on a couple of products, but I don’t quite know how to make that decision. There are a couple of other things weighing on me, as well, but they’re a little too personal to record here, so I’ll just leave it at that. I’m guessing the open loops I listed above parallel your open loops. Our lives are unique, but most of us have a HUGE list of things on our minds. My first instinct is to climb back into bed and watch When Calls the Heart, but that won’t solve the issue. Instead, I’m going to make a plan that I know I can execute. Step 1: Identify what can be done in two minutes or less. David Allen’s two-minute rule says that when you have a two-minute task, you don’t write it down on a task list. You just do it. Side Note: Jonathan Bailor, from SANE Solutions, wrote a book called The Calorie Myth, that totally changed my life. I learned how I never have to be hungry again by eating lots of healthy foods. We have a SANE Families Program here at LearnDoBecome, if you’d like to learn more! Step 2: Figure out what can be delegated. 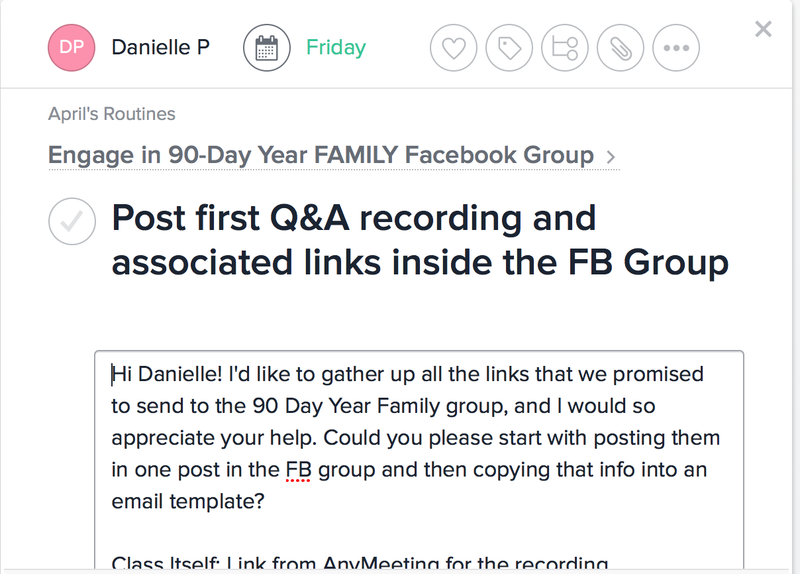 Danielle and I share tasks with each other in Asana, so for something like posting the links from the Q&A call, I simply outline all the details, select Danielle as the designee for that step, and give it a Friday deadline. I don’t need a calendar trigger to follow up because Danielle is 100% trustworthy. Interested in using Asana? Find more of our Asana resources here! Step 3: Block out time for key discussions. Eric and I work from home together, and although we have an outing planned with the children this morning, we’ll be back in the office this afternoon. 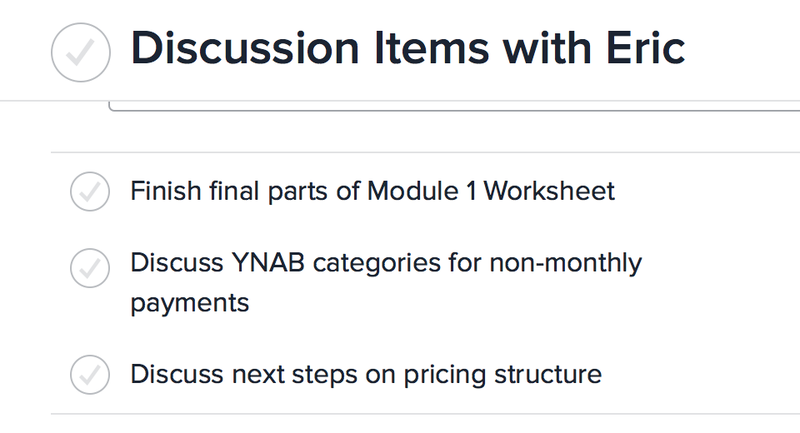 That would be a good time to talk with him about the YNAB categories and next steps on establishing our pricing structure–plus we need to finish up a worksheet we’ve been filling out for an online course we’re taking. Step 4: Identify the best time to work on bigger projects. Looking at my initial list of “overwhelm,” the only things left are getting my emails to zero, figuring out when to post Greg McKeown’s interview, and putting all of my ideas into Asana. The “Emails to Zero” can be started right now. I’ll go through a similar process of completing the two-minute ones right away, delegating what I can, creating agendas/discussion items, and noting details for project-related emails within Asana. All emails that are linked to a task, discussion, or project are referenced alongside the task itself and added to my @Tickler folder (I’ll write something like, “See email 7/12 @Tickler), where they will wait patiently until they are needed. That way, my inbox stays at zero. You have a lot coming at you. I get it. And while no day ever goes exactly as planned, when your brain knows that there’s a plan in place to review and accomplish the tasks and projects on your plate, your mind will feel calm. No more open loops, and no more anxiety over those to dos. It’s a little piece of heaven every day. This process of closing open loops is exactly what we do inside of our Steps to Everyday Productivity program. 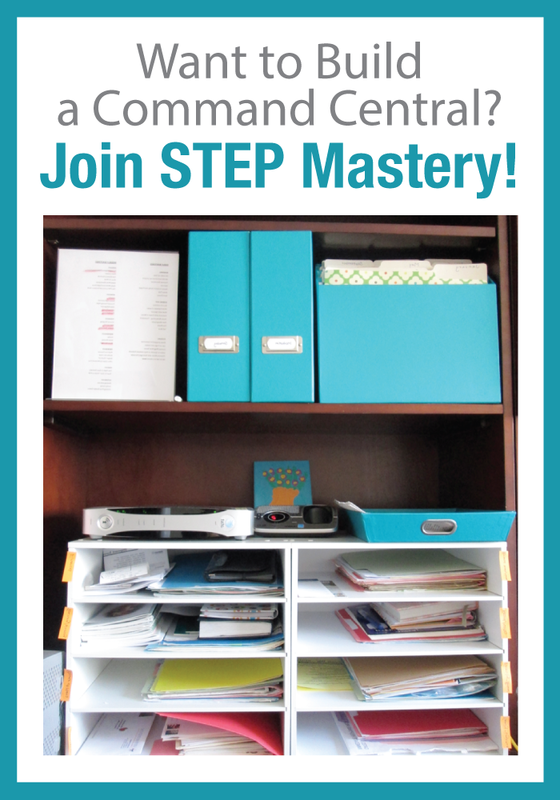 Want to learn more simple tips to build your very own “command central”? Join us for a class this week! 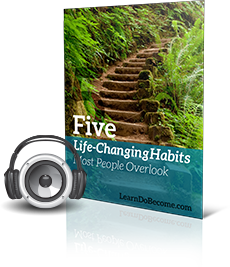 And for a few simple tips you can apply right away to begin architecting your life, download this free guide: Five Life-Changing Habits Most People Overlook. Hi Claudia! It’s You Need a Budget–a great tool for keeping track of your spending! Check out http://www.ynab.com. I’m excited about this post! Thanks for getting me motivated to check some things off of my to do list! Absolutely, Michelle! Hope your day is wonderful! I love your reminders about the basic GTD processes and principles because I seem to always start to slip over time and getting back to the basics always teduces stress. My single biggest hurdle with GTD is making sure I go through my inbox on a regular basis. I just seem to resist it, for some reason. Any tips? Hi Jana! Have you tried setting it as an appointment on your calendar? Or do you have your Weekly Review reminders and flow chart in an accessible spot for you to review? I’d love to know what scares you about it. 🙂 What feels hard? Is there too much going on in your life right now? I find when I procrastinate something it’s because I have worries or fears I don’t want to face–or I think it will be harder than it really is. I’d love to be helpful! Melissa, you’ve hit on something so key! It’s easy to move toward “quick wins” and not dive into the bigger/harder projects. I’ve found that setting a time limit of 15 min in the morning for email works–and then I don’t check it again until I’ve completed some of my bigger projects and tasks. Recognizing the habit is the first step. 🙂 Wishing you the best! Thank you so much for sharing so many specifics. Did you do a mind sweep to come up with this list of open loops? How do you remember it all after being outside of the system for awhile? I tend to forget the things that I didn’t put right into my inbox, and then don’t necessarily remember them when I’m sitting down to do my weekly review, and the trigger list of ideas for the mind sweep can be overwhelming. So I just put off making a list and hope that next time that thought comes to me, it isn’t too late, and I have a handy way to catch that thought available at that time… Not the best system. Hi Kristen! Great question. 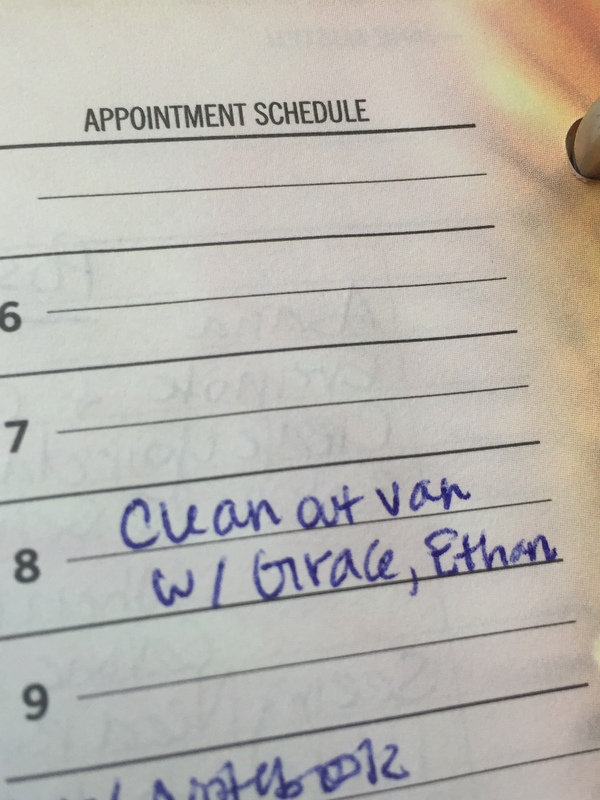 Usually when I am on vacation, I end up jotting little notes down in my planner…or a few things will pile up in my task list or calendar. I did sit down and do a mini-mind sweep, reviewing my email inbox, my task lists, my calendar, and anything else I’d jotted down on a Post-it or something… The key for me has been to write EVERYTHING down somewhere I can easily pull it together once I have time to get my head on straight. My paper planner is great for that because it gives me a place to throw everything when things are busy. Or I send myself a quick email because I know I always process my email inbox. Hope that helps! I’d love to find out what ends up working best for you!